Why use Excel spreadsheets and other ad-hoc tools to plan and track your marketing budget? 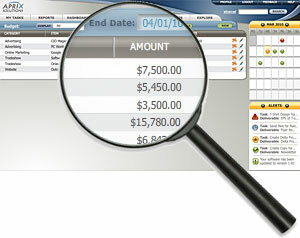 Aprix Marketing Manager gives you an online budget module for easy control of your marketing expenses. Create marketing budget categories such as advertising, collateral, campaigns, online promotions, trade shows and events, personnel, and more. Customize categories according to your needs and organize them into groups of expenses that will later help you report back to your CFO without the hassle of having to run endless reports. Access and share the marketing budget with only the people authorized to view confidential information and ensure expenses are at check throughout the year. To start using your marketing budget online with Aprix Marketing Manager you don’t need to spend time setting it up or creating complex options, just start typing and entering the data you need. Let us take care of the administration and the menial tasks while you can focus on what you really want to do – marketing!